Thanks to Patsy Brady, who has submitted the following information to me. When doing research for another project he came across the report of the setting up of the Emyvale Cycling Club. It was a touring club until the early 1930's when it began taking part in competitions and has been in existence since then though it did change its name once or twice. It was known as St. Christopher's Cycling Club for a number of years. Emyvale Cycling Club: On Monday evening the 13th inst., a meeting was held in the Courthouse, Emyvale, for the purpose of forming a Cycling Club. There was a good attendance. On the motion of Mr. J. Donaldson, seconded by Miss. Amberson, it was decided to form a club and the following officers were elected - Charles Reighill (captain), John F. Woods, (secretary), and James Elliot, jun, (treasurer). On the 17th inst., the first run of the new club took place to Caledon, via Glasslough (sic), and was heartily enjoyed by all who took part in it. Weekly Runs will be held in future. Numbers were low on Sunday morning for the club spin with the wet weather and a large number of Emyvale cyclists were doing the Lap the Lough tour round Lough Neagh. Nevertheless the small group headed off on the route to Glaslough, Middletown, Keady , Granemore, Armagh, Moy and Eglish and home via Caledon. Well done everyone. Congratulations to the Bell family on finishing their Mizen to Malin challenge on Sunday in wet and windy conditions. 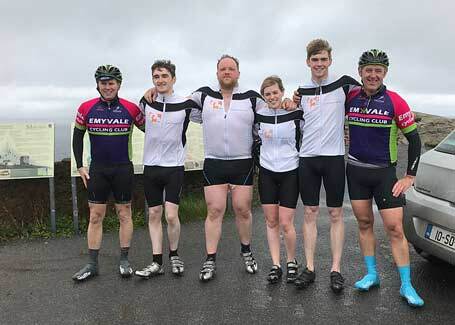 A large number of people where at Malin Head to cheer them on up to the finish and Emyvales Mark Skeath and Johnny McKenna accompanied them on Sunday on the cycle. 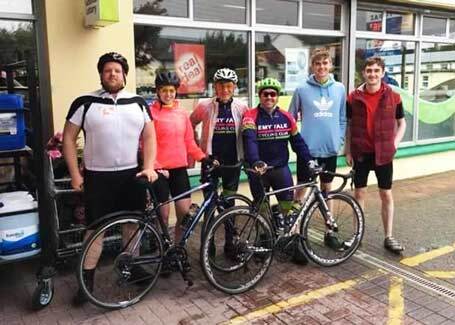 Fergus Murray and Tommy McCague also cycled with the family on Friday from Ballymahon in Longford to Ballinamore Co. Leitrim. Well done lads. Well done to Shauna, Dara, Mark and David and to their mum Noreen on what was a tough and emotional challenge over the 5 days. Gabriel would be very proud. Also in Innisowen on Sunday, Emyvales Martin Connolly was riding in the Ulster Championships in Ballyliffen . Martin was in the A3s along with the A1s/A2s and Juniors and came in 6th A3 on a tough championship course. The club TT continues on Tuesday evening next, sign on from 6.30pm. Numbers are great this year with over 30 adults and a good number of youth cyclists taking part each week. The youth group continue to go out on Saturday afternoons. The youth league will be starting this Saturday and will run on for most of September.